There are injustices throughout the history of baseball that people have tried to remedy with varying degrees of success. Integration was a major injustice on several levels that has been addressed within baseball. While it has not been conquered on all levels, at least on the playing field it went as planned. We are all familiar with the story of Jackie Robinson and Branch Rickey integrating the National League and being racial pioneers within the game. But what about the first player on the American League side? Today’s book takes a look at what transpired for the second racial pioneer in the game Larry Doby, and why he never got the respect, attention or praise that Jackie Robinson received only a few weeks prior. For me it is easy to understand why Larry Doby is not given as many pioneering accolades as Jackie Robinson, he was #2. Yes he was the first in The American League, but was second under the umbrella that was Major League Baseball at the time. No matter what the sport, being number two is never any good. People only care about the first at whatever it is, so that was a major reason as to why Doby never got as much press at the time. He also was in Cleveland instead of being in New York, a city with three teams which was just coming into its own golden era in the late 1940’s. That factor alone is a big reason why many players got the coverage from the media that they did. Doby could have been in Boise, Idaho and people could not have cared any less than they did when he was in Cleveland. Also his relationship with owner Bill Veeck could have hindered press coverage of his career because of the disdain the other owners and the old boys network had for old sport shirt Bill. These are just some of my ideas that I have had for a while and the book tries to prove some of these, but unfortunately does not make the grade. Author Douglas Branson is a self proclaimed Larry Doby fan. Finding both Doby and baseball at an early age he always felt that Doby had been slighted by the baseball gods and the media. For various reasons I stated above he seems to want to try and prove these points through his research and other peoples writings. He like to quote a lot of others peoples books in trying to make his case on the above points. That method to me just felt lazy in the research of the book. He also quotes earlier pages in the same book you are currently reading, which at times was driving me nuts. It disrupted the flow of the book and was repetitive as well. Factually, this book had several flaws as well. I am not sure if it an editing fault in which the person doing it did not have a strong baseball knowledge, or if the editors felt the author’s facts were correct due to his vast self proclaimed baseball knowledge. Either way there are several factual errors within the book. Names, places and events were all part of the problem. There were so many errors it was embarrassing. So many, that even the outside back cover where other authors tell you how great the book you are reading is, contained errors. Usually from this publisher we see fewer errors and this book really surprised me on that front. As hard as I tried I couldn’t find any redeeming qualities about this Larry Doby volume. I really wanted this to be a good biography, since so few exist. If you are one of those people that have to read any new book that contains anything about Larry Doby or the Cleveland Indians, then no matter what my final synopsis is you will still check it out. But in all honestly, save your money on this, it is so riddled with errors and factual mistakes that it brings into question the entire body of work. I think there has always been a shortage of Larry Doby material on the market, but this is not the direction it needs to take. We need a quality Doby biography that is factually correct, and gives the man the respect he has deserved for decades. Owners are an interesting lot in Major League Baseball. Some are from the old school and don’t really care about the fortunes of the company, they just want to own a team. Some are in it for the profit aspect, while others ownership groups are part of a corporate conglomeration. I have always found the individual owners the most intriguing. Some of the best off-field personalities within baseball have come from ownership. Walter O’Malley, George Steinbrenner, Bill Veeck and Charlie Finley are just a few of the greats that have come from that group. Baseball has always been considered a good-old boys club but there have been a few exceptions to that rule. Today’s book takes a look at those exceptions and the great contributions the lady owners have made to the game of baseball. William A. Cook has taken some of the most influential names in female ownership within baseball and created in-depth biographies of each one. Owners such as Effa Manley, Joan Payson, Jean Yawkey, Marge Schott, Joan Kroc and Grace Comisky to name a few. Each woman came into ownership through a unique set of circumstances. Some were by design and some were by accident, but nevertheless it shows how each overcame the obstacles inherent to being a minority and owning a baseball team. This author does a great job of showing the state of each respective team when the owner took over, the coming to power and the final results the team achieved under their ownership. Finally the author tells us how each team was disposed of. It really shows a complete picture of what the ownership by each of the lady moguls accomplished during their tenure and where they have missed their mark. I have seen individual biographies on some of the women mentioned in this book, but really did enjoy the format of covering several of them in one book. 20-30 pages was plenty to cover each one of the owners and gave a thorough picture as to what each ownership group achieved. Obviously you would be able to complete a stand alone biography on any of the owners covered but this is a very nice resource to get your feet wet with a group of female owners. Fans who have an interest in the off-field history of the game really will enjoy this. It is a glimpse behind the curtain of stuffy team ownership and shows some of the driving personalities throughout history. Check it out I don’t think you will be disappointed. I have said this in one of my prior posts that I have the utmost respect for Bob Feller. His service to our country, his baseball career and the stand up guy he was, speak volumes about his character. While most of us don’t think much beyond his Hall of Fame career, he really was an incredible personality who was a great ambassador for the game. Feller has been the subject of, or involved in several books throughout his life so my first question upon seeing today’s book is why do we need another one now? One of my very first posts on this site was Bob Feller’s Little Black Baseball Book, and quite honestly I wasn’t all that impressed. So this book had me going into it questioning why it even existed. I was hoping I was going to find some great insight into life and about baseball from this book that I may have missed in Feller’s Black Book. I thought maybe I was too hard on that book in the review I wrote and perhaps it was me as the reader, that was not connecting with that books message. Well, after reading two of these books, I am confident in saying……I am not the problem here. 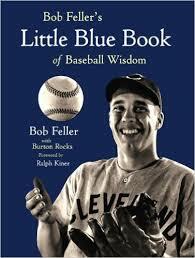 Bob Feller’s Little Blue Book of Baseball Wisdom has really given the reader nothing more than the Black Book did. It is background on Feller’s childhood and how he had the greatest childhood ever. Nothing could ever top Feller’s skill or experiences on the field and in his own eyes he has lived a charmed life all of his own doing. At times the book comes off quite pretentious and somewhat overbearing. I originally wondered why we needed this book, and I am now still wondering why. It is essentially a reworded version of the Black Book and doesn’t give the reader any new information. I realize the publication of the books is the good part of a decade apart, but it to me is essentially an updated volume of the black book. I have trouble recommending anyone who has Bob Feller’s Little Black Book to drop the money to pick up Bob Feller’s Little Blue Book. To me it is really just the same recycled stories and Feller patting himself on the back. Indians fans who have a strong association with Bob Feller will enjoy it just because the hometown boy wrote a book. Fans in other cities should probably pick either the Blue Book or the Black Book because essentially you are getting the same product in a different color. Choosing the best of the best can really ignite some serious debates. Who belongs, who doesn’t, who should be eligible and who should not even be there always makes for good conversations among friends. The Baseball Hall of Fame, which is nestled in that sleepy little town in upstate New York, is the mecca of baseball junkies. You can walk among some of the greatest artifacts throughout the history of the game as well as visiting the memorials to all the games brightest stars. If you are not lucky enough to be located within a reasonable distance of the Hall like I am (2 hours), then you may not be able to get there as often as you would like or even at all for that matter. I found a book, if you are one of the unlucky few that may never get there that will help you experience some of the magical aura that is The National Baseball Hall of Fame and Museum. The Baseball Hall of Fame has really published a first-rate book with this one. The quality of the book alone is incredible. From the paper stock, to the printing this is a really nice book. Quality of the book is something I really never comment on, but this one is really that good. The Hall has compiled all its members, including managers, executives and umpires and given the reader in-depth overviews of every single person. Each player section is broken down by position into its own chapter and then sorted by induction year. It has dedicated two pages to each personality and gives a nice biography of their career as well as a brief snippet of that persons unique personality. It is a nice feature for each person that you don’t always get in these types of books, because it is usually more focused on the career numbers. Each person’s Hall of Fame plaque also heads their individual page so you are able to read exactly what is hanging on the wall in Cooperstown. The other nice feature is a several page essay at the beginning of each chapter. A player from that chapter has written about his own experiences during his career that led him to The Hall of Fame. It is something you don’t normally see in a Hall of Fame coffee table book and adds a real human touch to this book. I think the Hall of Fame sometimes lacks a human touch when speaking about its members, so this brings it back to a very personal and fan friendly level. 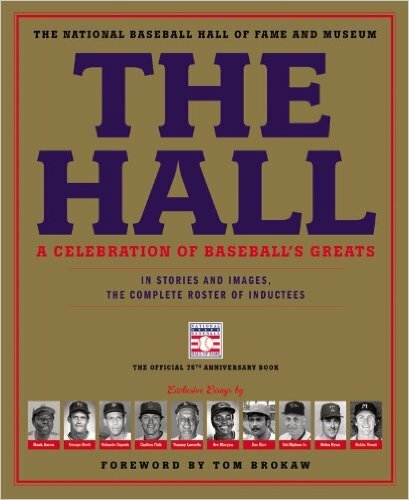 This book covers all the players that were enshrined as of the publication date. The only down side to these types of books is that they are not accurate for very long. Once the next July rolls around someone is missing. But honestly this book is done so well it should belong in every fan’s library. You may be familiar with some of the names, but there are others that are a real learning experience for fans young and old. Bill Veeck has been called a lot of things through the years. Innovator, Showman, Maverick, the P.T. Barnum of baseball and of course some other not so many nice names. A definite man before his time, no matter how many books come out about old Sportshirt Bill, I feel the need to read them. Bill Veeck always seemed to be the friend of the average fan. From early beginnings with his father working for the Chicago Cubs, Bill spent a lifetime sharing his love of the game. Working various jobs for the Cubs he cut his teeth in the field, and went on to team ownership. With stops in Milwaukee, St. Louis, Cleveland and Chicago, Veeck left an indelible mark on baseball that while unconventional at the time would be appreciated today. Paul Dickson undertakes the task of fitting all of Veeck’s exploits into one book. He visits all of Bill’s baseball stops and the shenanigans that earned him some of the nicknames I mentioned above. Ladies nights, midgets, game day give aways and of course disco demolition etched Bill’s name into baseball history. Dickson also looks at Veeck’s activities outside of baseball including running a horse track. Veeck had so many innovations both in and out of baseball that he could almost be called spectacular. Truly an ambassador for baseball, Veeck was rightly enshrined in the Hall of Fame shortly after his death in 1986. But what I find even better about this book is you see the principled man who stood upon that wooden leg——that he used most times as an ash tray. From civil rights to baseball integration to countless other causes that presented themselves in society. Bill Veeck had several causes he thought were worth fighting for. This shows the worth of the man himself. He may not been popular with the other owners for several different reasons, but as a person Bill Veeck seems like a really great guy. This is finally the biography Bill Veeck deserves. It portrays a complete and accurate picture of the man who was well before his time and someone to be admired for his forethought and decency for his fellow-man. Paul Dickson did a great job with this book. 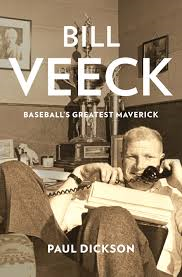 It is one of the best pieces I have ever read on Veeck and anyone who is any kind of fan of Veeck should read it. There may be some duplicity in some of the stories you have heard before, but the painted picture is complete. He may have made a lot of owners angry through the years, but he made lots more people happy and in the end, that’s what matters. He leaves a legacy that should be appreciated for all time. You can get this book from the nice folks at Walker & Co.